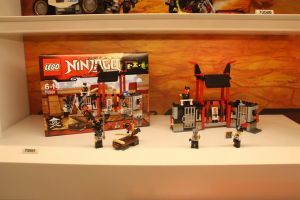 LEGO displayed seven upcoming Ninjago sets at the Nuremberg Toy Fair, due out this summer. The dragon and the two buildings would be easily adapted to an eastern-themed castle world. Zusammengebaut has more high quality images here. This line seems a lot weaker than previous ones. Like, I found few gems (the dragon especially) but it doesn't feel as, cool as early releases. Crazycrownieguy wrote: This line seems a lot weaker than previous ones. Like, I found few gems (the dragon especially) but it doesn't feel as, cool as early releases. I might agree, but you know those are mostly preliminary, right? josdu wrote: I might agree, but you know those are mostly preliminary, right? Generally not. Sets previewed at the various Toy Fair events (London, Nuremberg, New York City) are generally final products. These events are for toy manufacturers to promote their upcoming products to toy distributors, so they put their best foot forward (e.g. so Toys R Us will agree to pre-order ten thousand units of product x and twenty thousand units of product y, so that LEGO can plan their production run). If toys look bad, the distributors won't buy as many (of course, with a proven brand like LEGO they might slide more than some smaller brand). There have been a few cases in the past where the first runs weren't the final runs - notably the KKII sets, which went through a redesign, and the helmets on the first Star Wars snowtroopers, which were a 3d print since the final production molds were not yet finished, and occasionally things with preliminary stickers), but these have become rarer in recent years. Over the past decade LEGO has gotten much more polished in the way that they roll out new products at events like Toy Fairs and Comic Cons, and as a result there are fewer surprises between early displays and final products. As a result, this is a pretty good picture of what we'll see at least in the first half of 2016 (sometimes new things come out in the fall, and there are always special one-offs like the Temple or Airjitzu or the Ideas sets) (and of course they are teasing the Collectibles as they've done in the past). Are you speaking of the boxes? Because I do agree those are final almost always, but as there was some variance between them and the displayed sets one must be wrong (FE, in the playground set the wheelchair fellow had flesh hands on display, but not on the box). I've recently been hooked on the Ninjago line after looking at the newer sets out this spring. I recently picked up 70599 Cole's Dragon and had a ton of fun putting it together. The pirates are more steam-punk than anything, but the weapons are pretty cool and would work well in any castle-fantasy setting. 70602 Jay's Elemental dragon looks fun too, I'm loving the new ball-joint connections and could see making all kinds of fantasy creatures (golems, giants, etc) using them. They are whimsical and a little cheesy (who doesn't like a good old fashioned pirate-ninja brawl? ), but they do have some interesting pieces and I've been having a blast playing with them with my kids. I was never a fan of Ninjago but when I saw the 70603 Raid Zeppelin yesterday in a local store I just had to get it: Properly weird steampunk! Once built the set has a few flimsy parts like the decoration at the side of the hull but apart from that it is a very inventive and good looking set. I have no idea about the characters and the background story and I will equip the ship with my own crew. I will also remove the anachronistic computers at the rear and use the little white-blue flyer-thing as spare parts resource. All in all a lovely set and a real eye-catcher and I hope Lego comes up with more of that stuff in future. I've never had much like for the Ninjago line.... Until this year. I'm really loving the look of the new "Sky Pirate" series that is turning up on the shelves. I normally ignore the ninjago sets completely, but I've admired these on the shelf and will definitely be picking up some of them. As has been mentioned above, the steampunk styling of the sets has a lot of potential and the sets look like they have a fantastic selection of parts. The only improvement would be to get rid of the ninjago characters altogether and just put out a Sky Pirate theme.